So recently, as in two days ago, an article went up on Wired about scientists making a discovery that might help them see things too small to be currently seen. 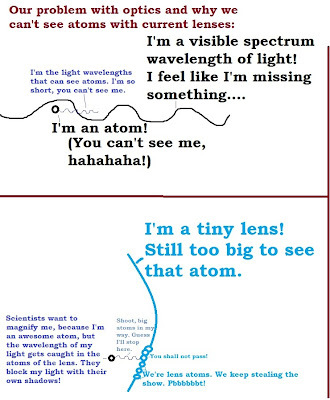 "Perfect lens" is the concept--a lens that does not get in the way of seeing tiny things. Okay, I'm not going to pretend I get the science. My optics studies are a little, er, rusty. As in, nonexistent after high school, which was *mumble* years ago. See? Makes perfect sense. Er, sort of. So according to my understanding of the article, scientists are trying to "bend light backwards," which to me sounds more like focusing light in a way that makes the wavelengths long enough to see. 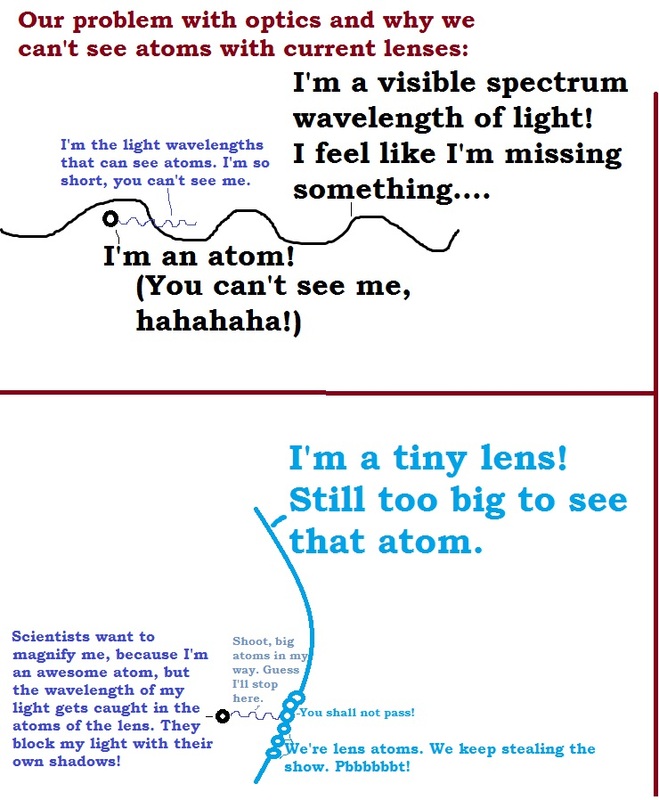 In other words, scientists make a material whose atoms line up in such a way that, instead of light bending in different directions when it hits the material (like when you look at a spoon in a cup of water, the spoon seems bigger and differently located), all the wavelengths of light get concentrated and lengthened in the same direction. This makes them something that we can see. This is what I imagine this article is trying to say. Okay, people who actually study this stuff... What's negative refraction actually doing? Is this even in the ballpark of correct? Love to hear how it really works (in terms a non-scientist can understand...)! Er, I mean, can you think of a cool way to use this? What's one way seeing atoms could be used in science fiction? In the real world?